This Saturday, I'm going to attend a blind wine tasting part where everyone has to bring two bottles (one red, and one white) costing between $6-$16 per bottle. At the party, guests will blindly taste and score each bottle... The person who brought the highest scoring wines wins an entire FREE case of wine! The hardest part of this challenge is going to be finding bottles of wine that will be rated high given the relatively low pricerange to choose from. I am curious to know how other people would handle this... What would you pick to win 'em all? Stay tuned for this weekend's results! I would bring Montoya Pinot Noir. I have heard of these parties in other areas, how can one find out about these in the St.Pete area? Love that Penfolds Koonunga Hill Shiraz-Cab! This particular tasting party is being hosted by a friend at his home. He just gets together about 10-16 couples and invites them to the party. I am not far from St. Pete... If you would like to put together one of these, I would love to help coordinate and enjoy the fun! I would bring Hedges C.M.S. red blend. Hmmm... interesting! How does that work as a strategy? Is it memorable? Subtle? Explosive?... or just plain awesome? You should take the Kim Crawford sauvignon blanc� I�m truly in love with her!!! My decision would partially be determined by the nature of the other attendees. Are they regular consumers, or more wine geeks? My decision would differ dependent on that answer. 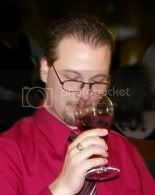 For a regular consumer, I would get a more fruit forward red wine, and for a white, maybe a Pinot Grigio or Chardonnay. (Though if the white could be sparkling, I would bring a Cava). Oh, I can't believe I forgot about bringing Cava! That would have been a sure thing! The worst part is that I can't tell really who will be attending... my gut tells me that the majority, if not all, of the attendees will be just regular consumers. That being said, I am a little concerned about the white wine I am bringing... I think I should have stuck to a Chardonnay. I wonder if it's too late to change my selection?